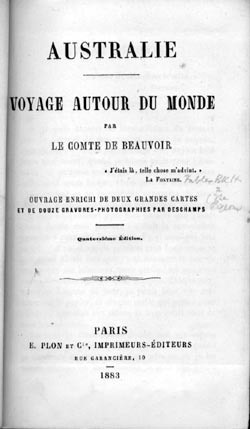 Being excerpts from Chapter 13 of the 14th Edition (1883) of Australie : voyage autour du monde par le Comte de Beauvoir. Paris : Plon, 1883. Translated from the French by Dr Marie Ramsland, School of Language and Media University of Newcastle Australia. A unique opportunity to cross the Torres Strait : The Hero. – Newcastle and its coal. Brisbane and the flying foxes. – Queen’s Land, a developing colony. – A story of human sacrifices in Dahomey. – A two-year-old city. – Cannibal fires. – The coral islands. – Where The Hero almost capsizes. 17 October. – The departure date has arrived! We were expecting to stay six weeks in Australia, and we spent fourteen, detained in each place by our ever-deepening interest and the constant hospitality. Instead of following the usual route of the English Mail via Melbourne, King George Harbour and Ceylon, an opportunity suddenly became available: the Government was sending a steamship to Batavia via the Torres Strait, in the hope of establishing commercial links between the Australian colonies and Dutch owned lands. The Hero was chosen for this dangerous mission. The attraction of sailing 1200 miles between the reefs of the Coral Sea, of crossing what was by reputation the most dangerous passage in the world, caused us not a moment’s hesitation, in spite of the fears and entreaties of all those who were concerned for us. At daybreak, we were on board. I can think of nothing to compare with the chaos, commotion and din that precede the departure of a liner, setting out on a voyage presumed to last a month. All the sailors are tipsy. That’s a necessity. The suppliers of food provisions are late and that is quite common no matter what the conditions. From up above our heads, the steam-operated cranes drop barrels of salted pork, live sheep and lowing cows. Ten thoroughbred horses, each tied securely with a strap, move agitatedly about, forming a parabola at mast-height, and no sooner are they on deck than they snort, slide about and roll frightened in the midst of the sailors who are even more terrified than they are. Groups of startled pigs charge from the poop deck to the forecastle, piercing our ears with their strident cries. Coal and fresh vegetables on a newly painted boat, everything topsy-turvy, everyone shouting at the top of their voices and a menagerie of cockatoos give out with the loudest sound of all! Fortunately they are not put on board until the very last moment. Then we cast off. The propeller forces us strongly forward, and we thrust ahead like a swift arrow, across the bay that seems even more beautiful than ever…. where people told us so many times: “You’ll be back one day”. All the places that had charmed us so much passed by once more in front of our eyes like a familiar spectacle; there was Macquarie’s Chair, Woolloomoolloo, Elizabeth Bay; and I told myself that Australia’s Eden was not Twofold Bay, nor Cape Oomooroomoon, but it was right here! And, slowly, the last houses, illuminated by the rising sun, were blotted out beneath a canopy of flowers and hidden completely behind the rocks where The Dunbar disappeared. Towards evening we were sailing close to the coastline. It was scorched, sandy and monotonous. We entered Newcastle harbour. The entrance is strewn with reefs, stirred up by rapid currents - in short, very dangerous. Amidst the reefs, we could see the tall masts of the steamer Cowarra, which had been shipwrecked since our arrival in Australia. It is about 500 metres from land and what is shocking is that out of 275 passengers only one, a young man 20 years of age, survived by clinging to a buoy. is the biggest and the only coal market in the Australian colony. We were extremely keen to visit the mines, which, with such intensive industrial activity, are worth 100 times more than gold mines. 18 October. - The directors took us on horseback to the Waratah mine: two tunnels, each of 800 metres, run horizontally into the side of the mountain, which is one enormous block of coal. This is the start of a vein the end of which cannot be determined. It is several kilometres wide, four metres thick and gets deeper as it runs in a southern direction with an incline of 5 metres for every 300metres. The Waratah employs 250 workers paid at the rate of 4 francs 40 centimes per tonne. They extract an average of three thousand five hundred tonnes a week, which brings a return of 10 francs 35 centimes on the spot. This mine is the most successful one as there is no need to dig pits, nor to use machinery since the mineral is on the surface. It has a strong advantage over its competitors, which are weighed down by the need for deep tunnelling and which nevertheless have to sell at the same price. Further on we visit the “Bore-Hole” where we go three hundred feet beneath the earth’s surface. This is one way like another to get closer to Europe, and we see how much cleaner a coal mine is than a gold mine. The Bore-Hole belongs to an important company, “the Australian Agricultural Company” which does business of all kinds - coal, horses, cabbages, cattle and sheep. The government gave it 2 million hectares, purely as a donation. It bought 800,000 hectares more for 20 million francs. It has about 200,000 sheep, 20,000 cattle and 500 men employed, shepherds and miners that cost the company 1,750,000 francs. This is an example of “squatting” by association, that is rather common in Australia. The shareholders would not sell for a king’s ransom; each person impatiently expects to make his own million and they tell us that they no longer have long to wait – happy financiers whose future must make those with confidence in the Mexican loan feel envious! 42 crewmen and has a 1,200 tonnage which, as you can appreciate, leaves scarcely any room for the merchandise. It is a pilot balloon sent up by Australia to open up the route – heavily loaded merchant ships will follow if it is successful. 22 October. - We left the waters of New South Wales and entered those of “Queen’s Land”. As for the waters from heaven I would think that they were intended to drown us on board ship – a terrifically heavy shower, a real downpour, which broke up everything on the vessel. The storm with cold clouds from the south came up very quickly against the low warm breeze from the north. There was a moment of equalising struggle above our heads, then the two electrical charges combined and everything erupted. The condensed vapours precipitated in the form of hailstones as big as pigeon eggs, and the barometer rose a quarter of an inch in one and a half minutes; the common dance of all of our instruments, which were spinning around, was in keeping with it. Everyone took refuge in the steerage. Several jays and parrots in the menagerie were killed stone dead in their covered cages by ricocheting hailstones; highly bruised dogs howled in pain. The panic was short-lived but extreme.